Author: Maciamo Hay. Last updated: May 2017. 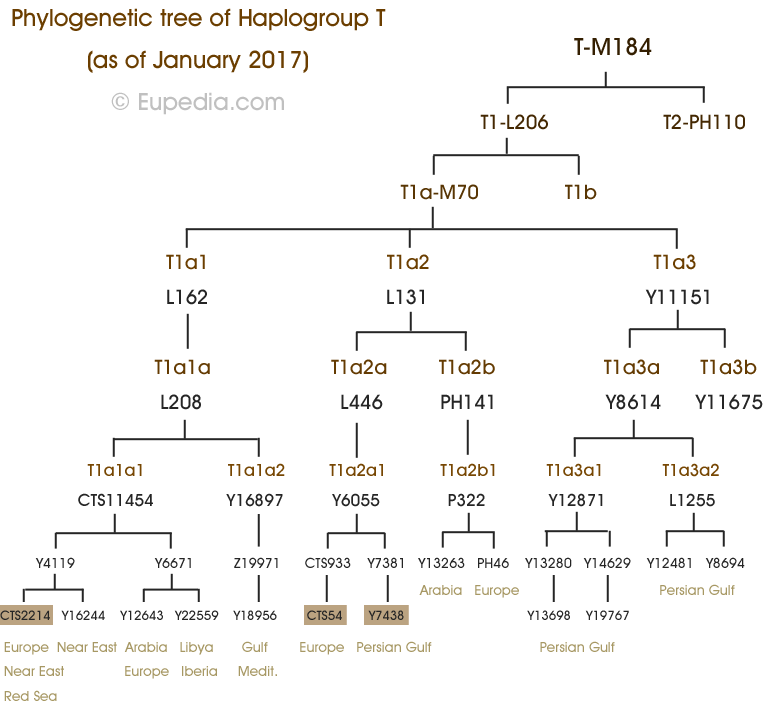 The trees on this page represents the phylogeny of European and Middle Eastern Y-chromosomal DNA (Y-DNA) haplogroups. 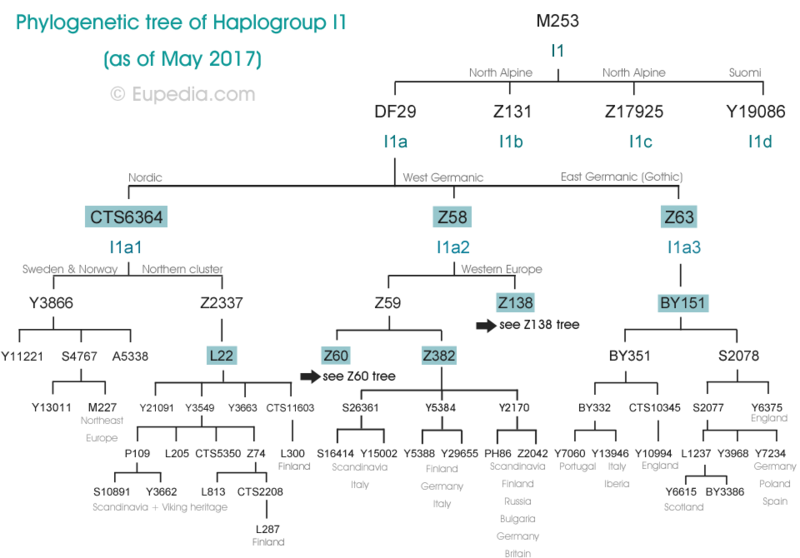 A Y-DNA haplogroup is a group of men sharing the same series of mutations on their Y chromosome, which they inherited from a long line of common paternal ancestors. 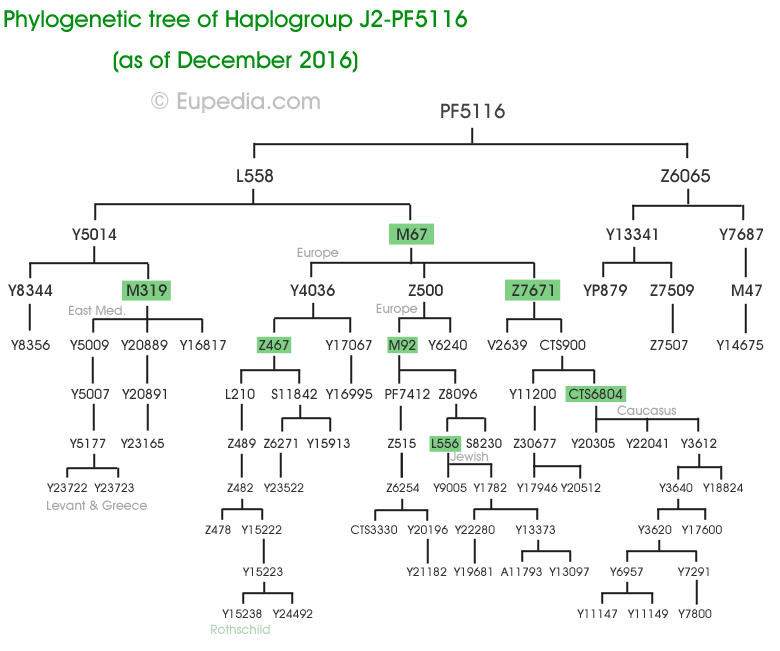 A few new mutations, known as SNP's, happen every generation, and are passed unchanged to the next generation. 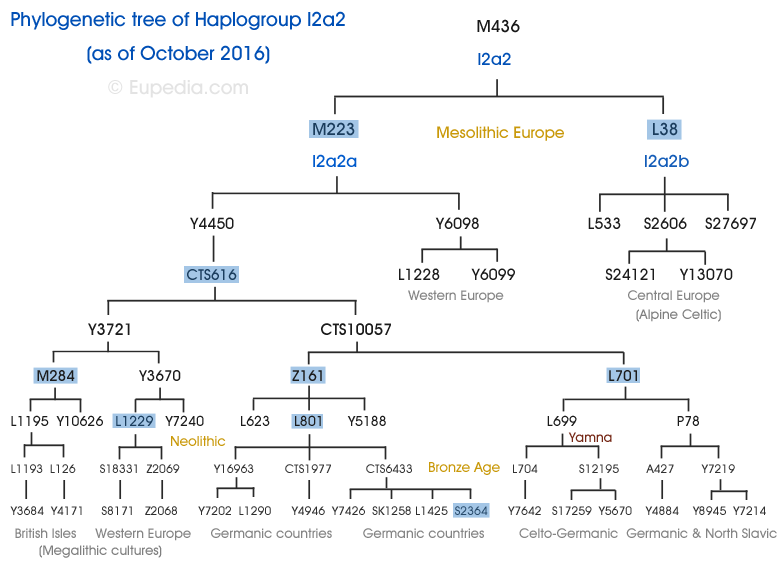 Classifying the accumulated SNPs generation by generation make it possible to retrace the genealogical tree of humanity with great accuracy, to detect patterns in the distribution of shared historical lineages and to retrace historical migrations of male lineages. 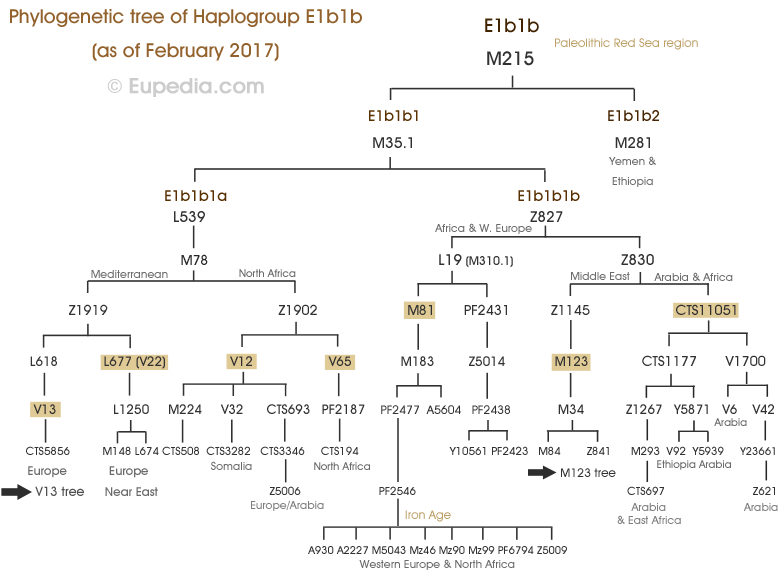 Most top-level haplogroups (e.g. 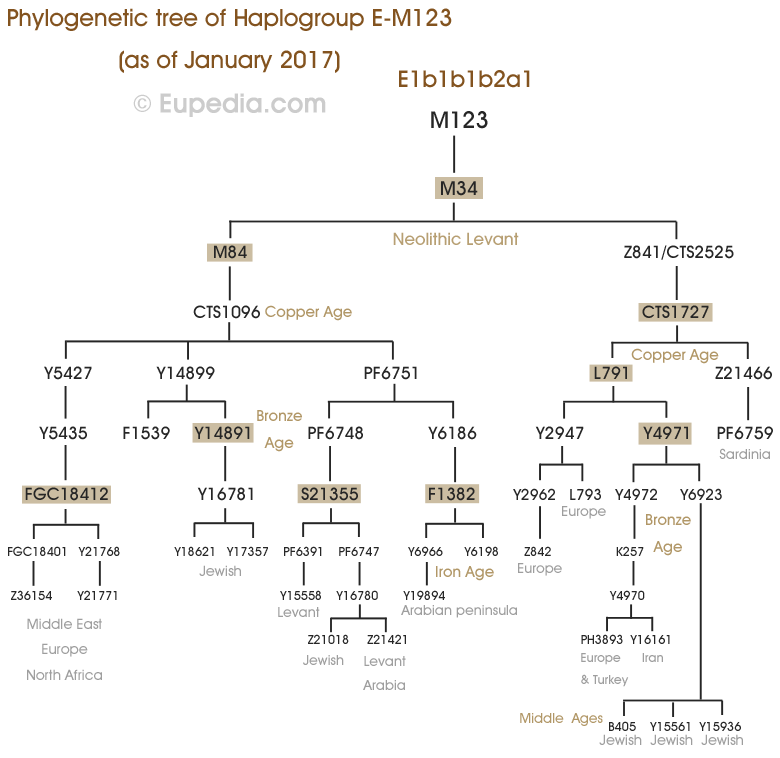 E1b1b, I1, J2, R1b) are tens of thousands of years old, typically going back to the Mesolithic or Paleolithic period. 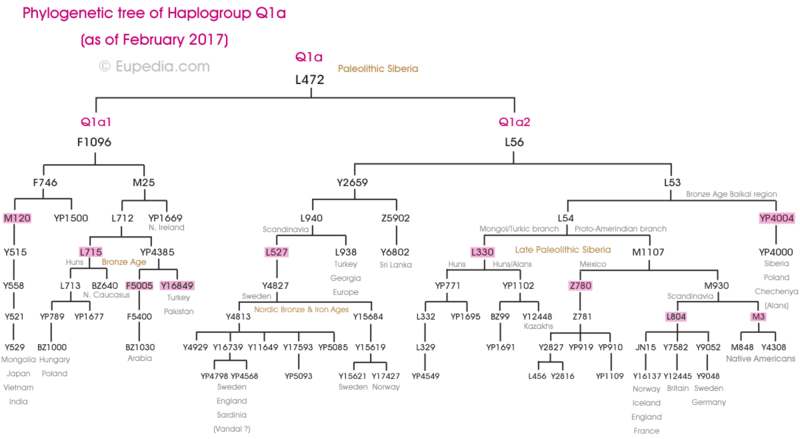 The main clades within a haplogroup often match large ethnico-linguistic groups, which are usually displayed with a defining SNP (e.g. E-V13, G2a-L497, J1-P58, R1a-M458, R1b-U106). 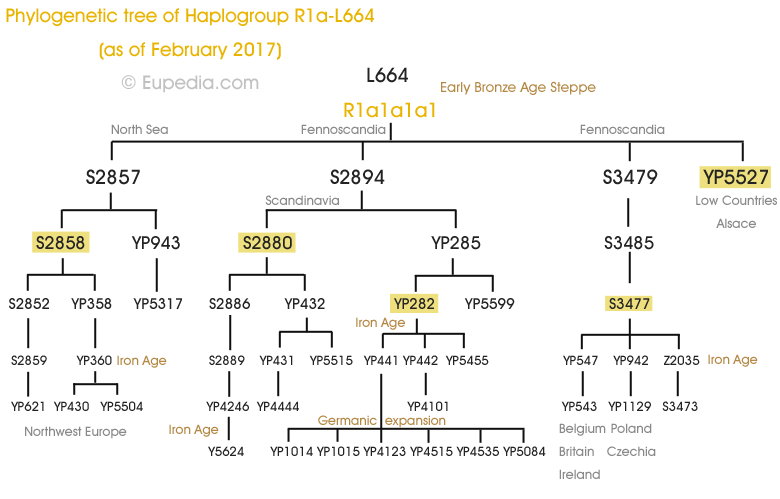 These main clades were for the most part formed during the Neolithic or Bronze Age. 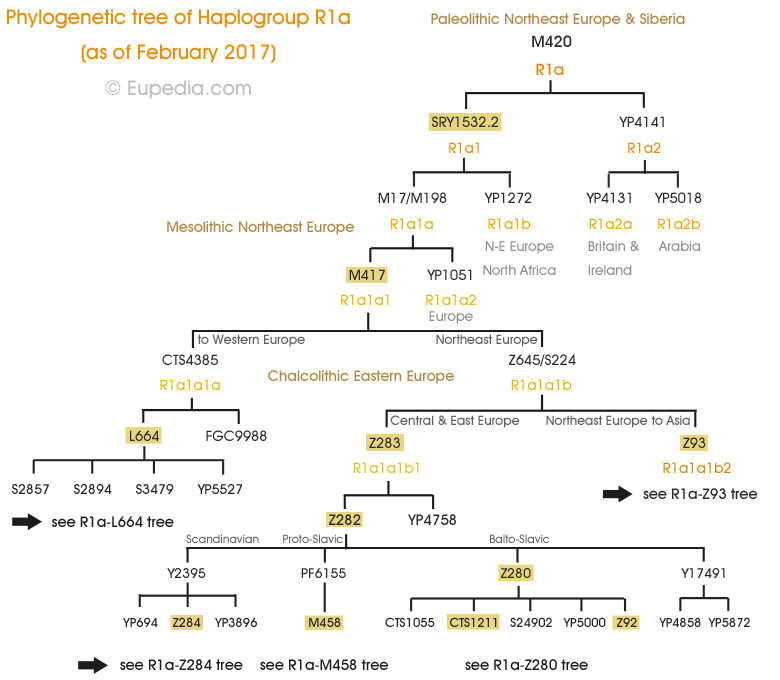 Deep clades, also shown with a defining SNP (e.g. 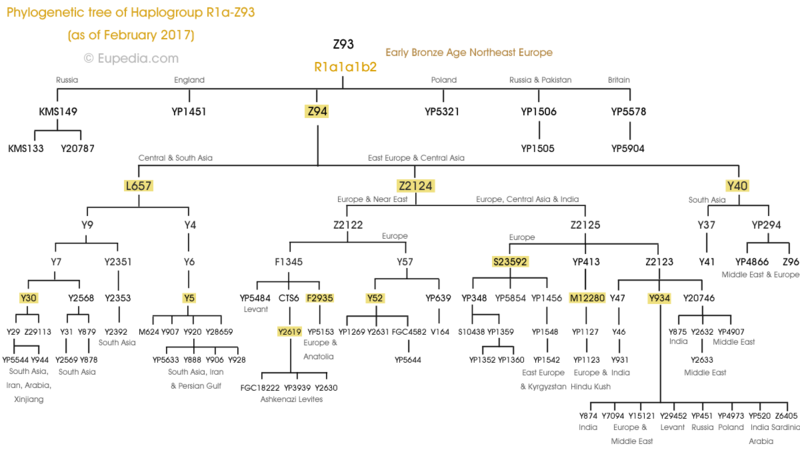 I1-L1302, I2a2a-Z78, J1-ZS227, N1c-M2783, R1b-M222), represent younger lineages, which arose during the Iron Age, Middle Ages or later. 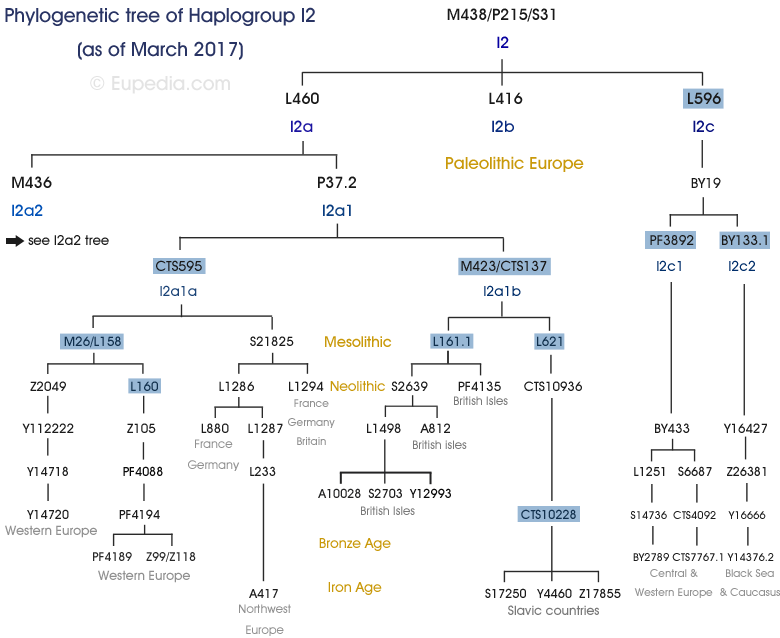 The deeper the subclade the more recent the shared ancestor (=> see also How to trace back our ancestry with DNA?). 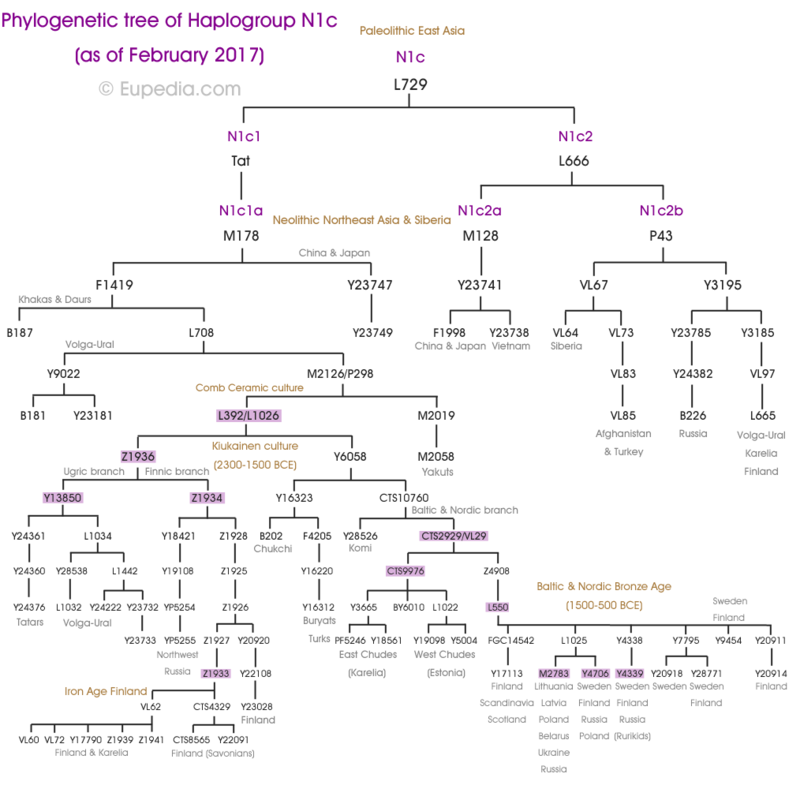 Classifying SNP's into a genealogical order is known as phylogenentics. 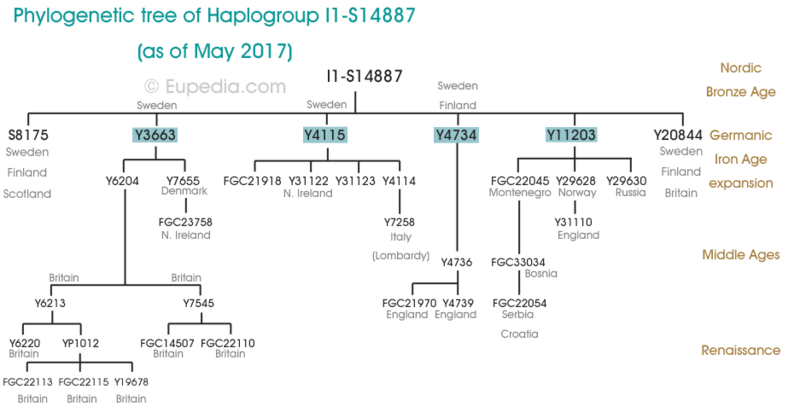 Note that some SNPs have more than one appellation, known as aliases (e.g. 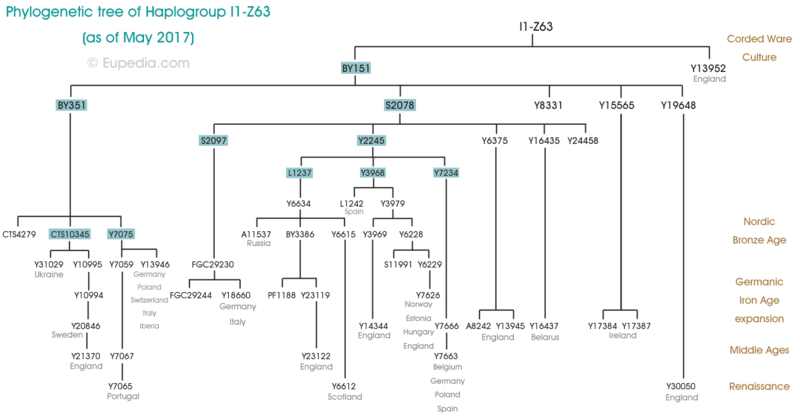 S21 and M405 are the same mutation as U106) because testing companies that discover them each have their own nomenclature. 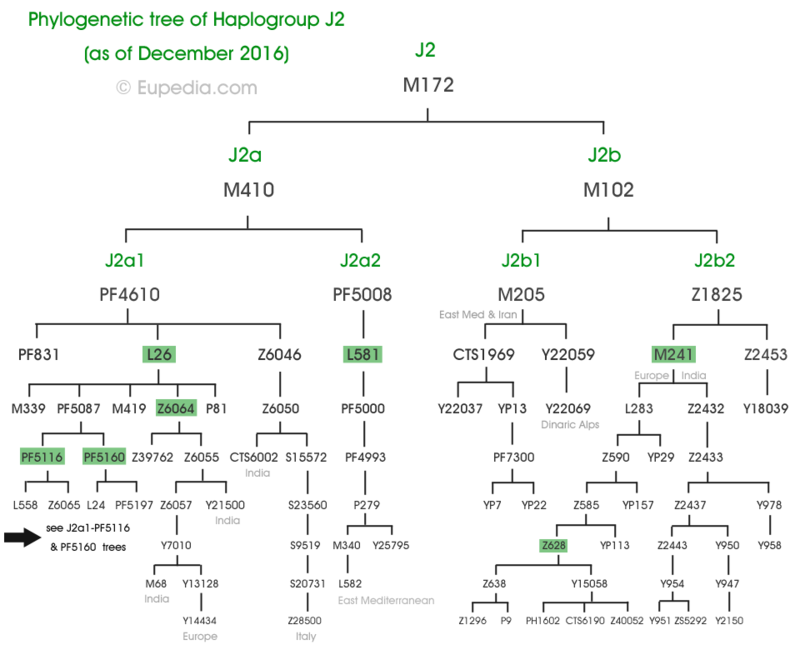 For example, SNPs that start with M were identified by Stanford University, the L series (e.g. 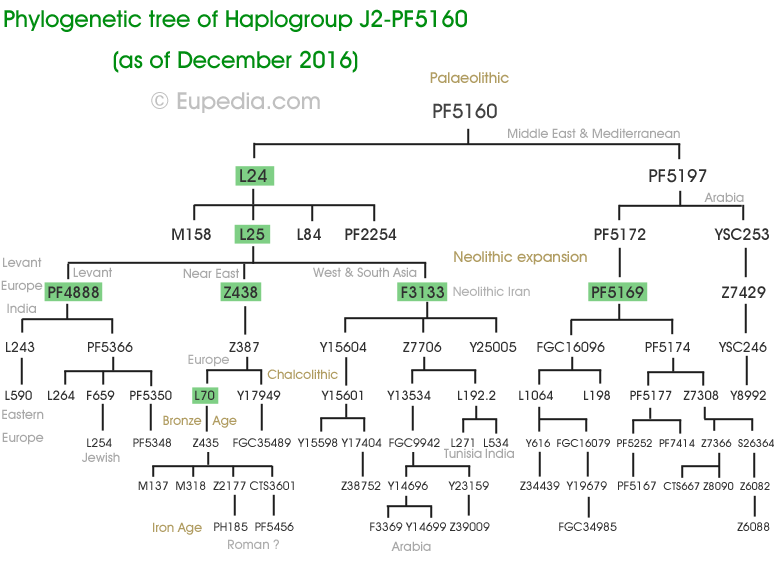 L21) were found by Family Tree DNA in Texas, the PF by the Università di Sassari in Italy, the U (e.g. U152) by the University of Central Florida, the S (e.g. S21) by EthnoAncestry, and the CTS by Welcome Trust Sanger Institute in Cambridge, UK. 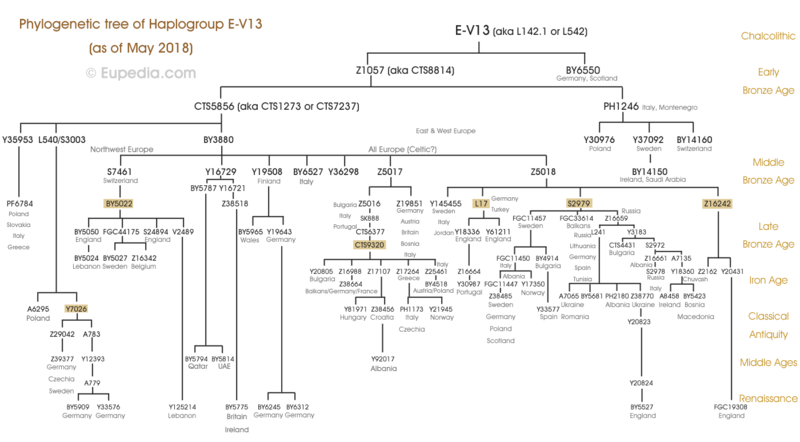 The DF and Z series come from various members of the Genetic Genealogy community. The Y series were identified by Yfull.com. 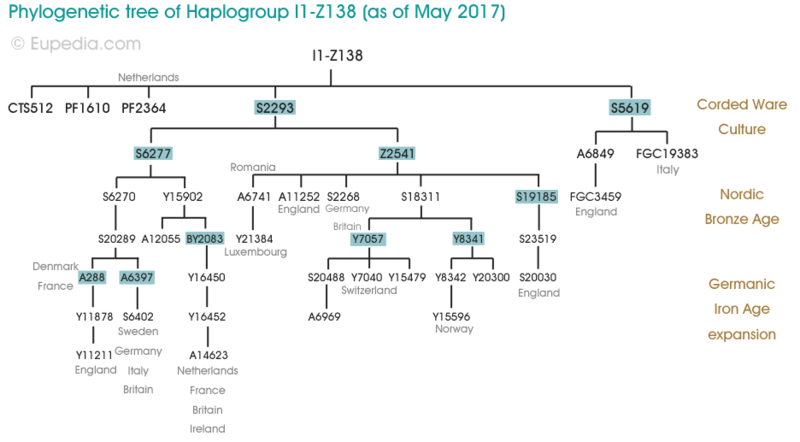 Y-DNA tests have existed since the early 2000's, but testing was at the time limited to individual SNPs, one at a time. Then, year after year, came packages of tens, then hundreds, then thousands of SNPs. Since 2014, new commercial tests have permitted to sequence millions of SNPs at a time, covering most of the Y chromosome. 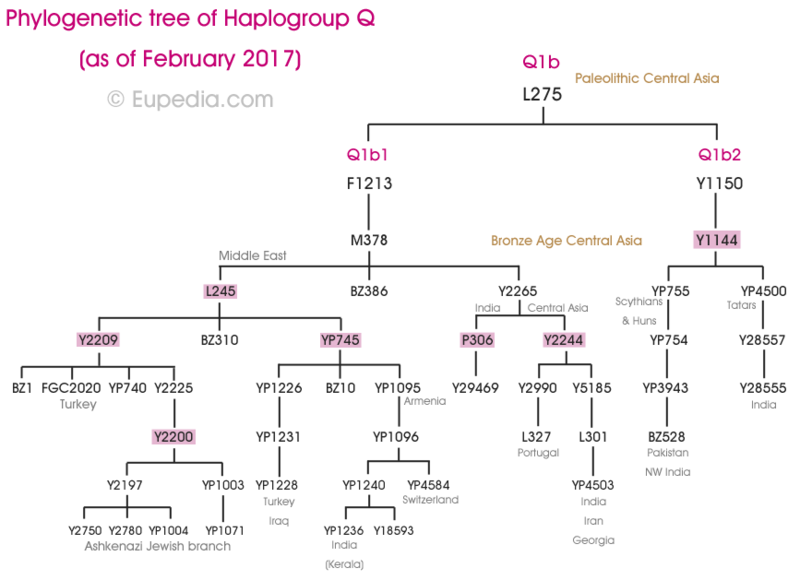 This allowed the quick discovery of tens of thousands of new SNPs, which made the phylogenetic trees grow to a very high resolution, with sometimes only a few generations separating the deepest ramifications of the tree. 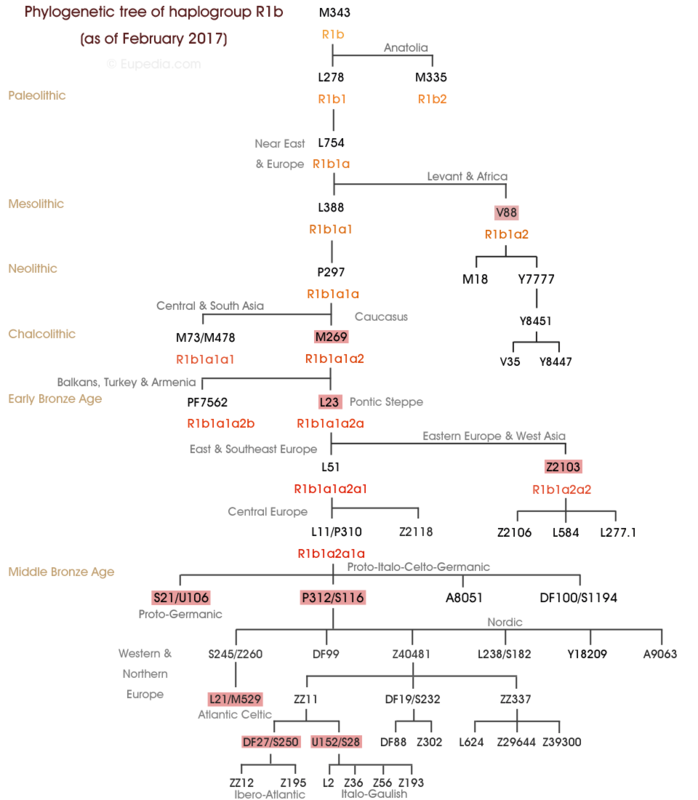 Such a high resolution would be clumsy to render here, so we decided to limit the depth to the Middle Ages, when most modern ethnic groups were formed. The pioneer of whole Y-chromosome sequencing was Full Genome Corprations, and SNPs discovered by this company start with FGC. 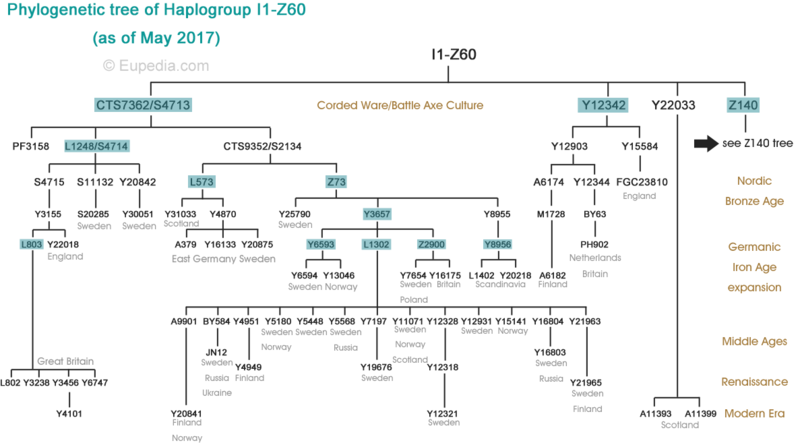 Family Tree DNA developed a similar test, known as Big Y, whose SNPs are indicated by BY (=> see also Which DNA test to choose?). 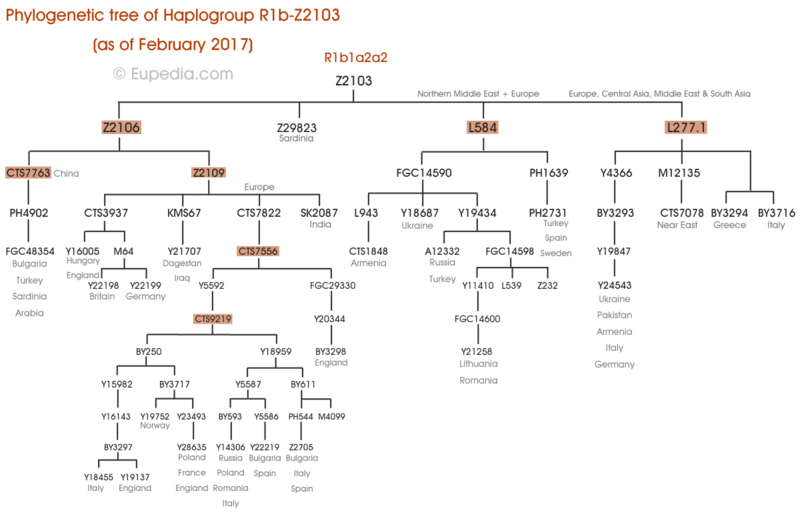 It is important to know that many haplogroups and subclades are defined by more than one SNP. 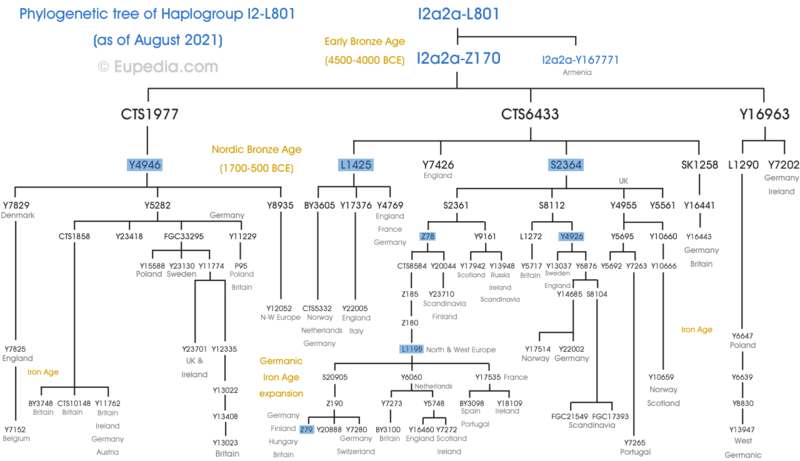 Paleolithic lineages that underwent serious population bottlenecks for thousands of years sometimes have a series of over one hundred defining SNPs (e.g. 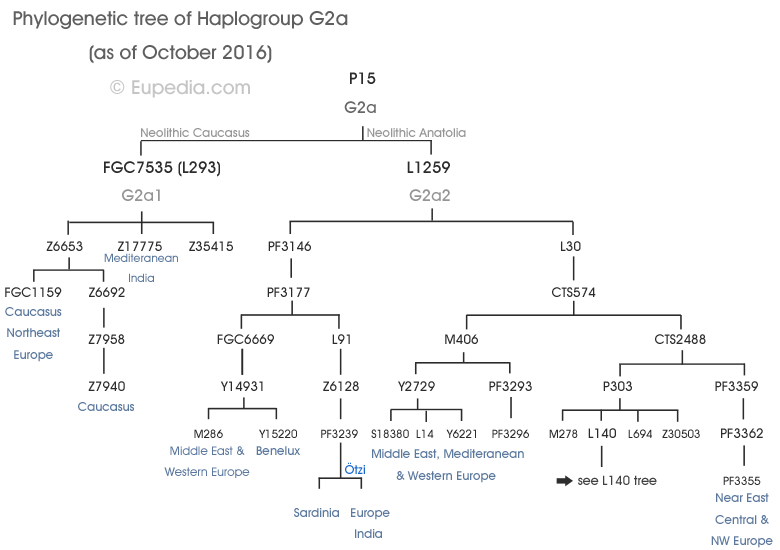 haplogroups G and I1 each have over 300 defining SNPs). 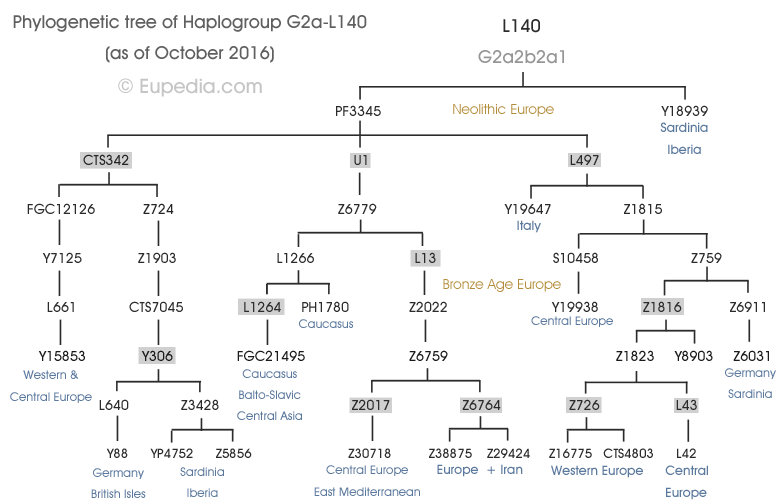 Generally speaking the number of accumulated SNPs between a haplogroup and its direct subclade correlates roughly to the number of generations elapsed. (It's a bit more complicated than that, as mutations occur more frequently on some segments of the Y chromosome than on others, and that should be taken into account too for the age estimate.) This page aims at providing trees that are easy to visualise, and consequently only the most commonly used SNP will be shown. Sometimes an alias will be shown, if both are regularly used, and the two equivalent SNP will be separated by a slash (e.g. U106/S21). 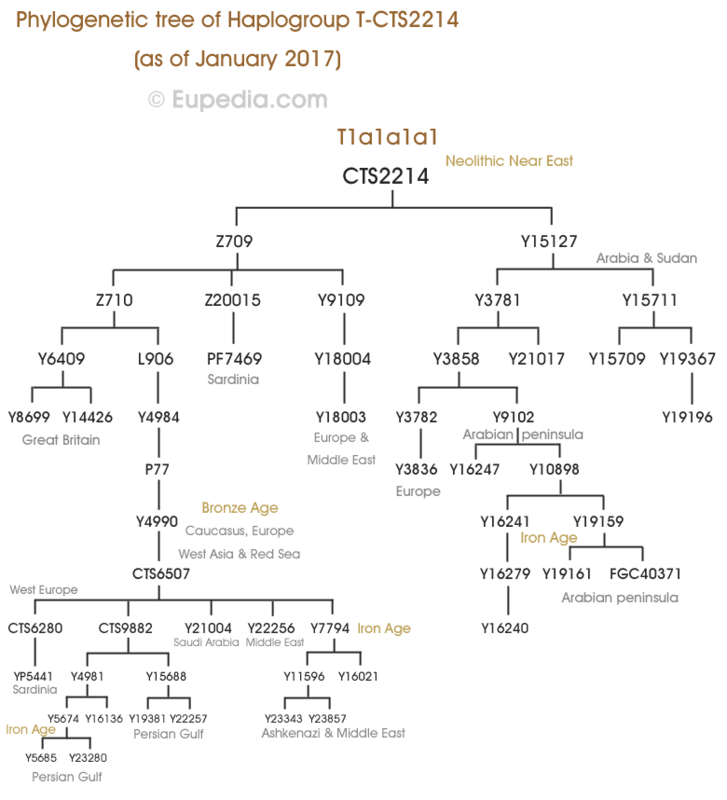 For an exhaustive list of mutations, please refer to Yfull.com (also includes the age estimate and TMRCA for most subclades) or The Big Tree (more detailed, but for R1b-P312 clades only).